Can't decide on which savings account is best for maximizing your interests ? This calculator will help you to decide whether the OCBC360 account or UOB One account (including credit card rebates) is better for you. Fill in the following questions and press "Calculate!" to see the results. Q1. Are you able to credit at least $2,000 of your salary to the bank account? Q2. Are you able to pay 3 bills thru GIRO (or online payment) every month? Q3. How much do you spend on your credit card every month? Q4. How much are you able to invest or insure ? Q5. How much money do you keep in the bank account? The information is accurate as at 28-Feb-2018. Quality dress shoes are expensive, but they can last decades - especially if they are cared for properly. I used to think nothing about the maintenance of my shoes, until i started buying leather shoes that cost more than a few hundred - shoes that would be too expensive to throw away. This was when i started to wonder how i could properly maintain and extend their lifespan, effectively stretching that dollar on the 'investment'. That’s where shoe trees and proper leather polishing/nourishing products come in. 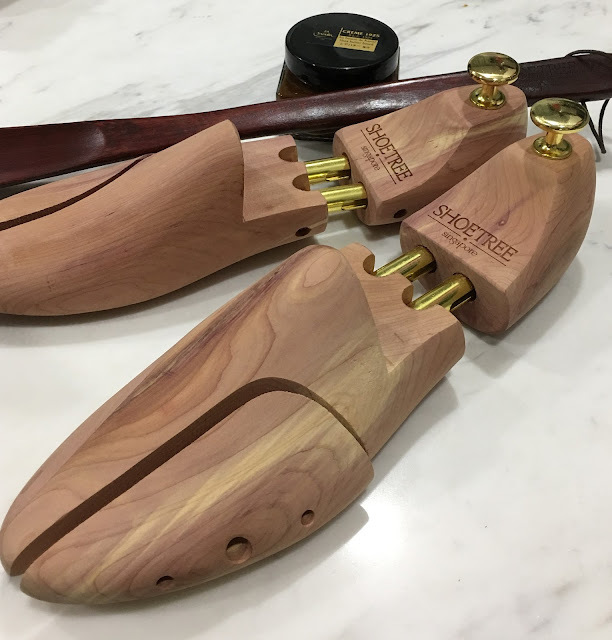 Some men look at these wooden shoe inserts as an unnecessarily expensive purchase, but shoe trees are crucial to keeping shoes in amazing shape as they age. 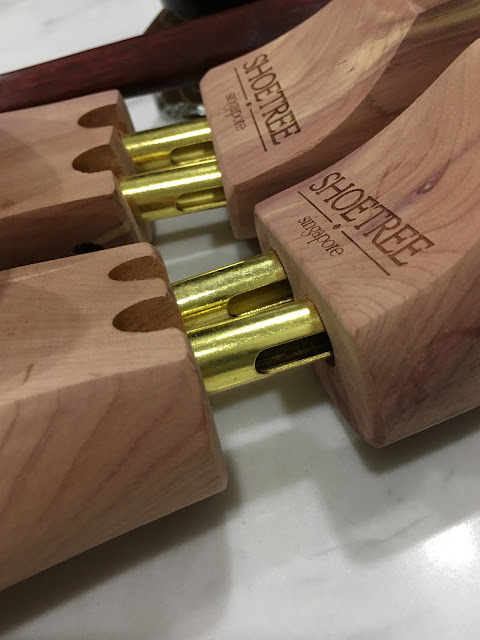 DO I NEED SHOE TREES? Our feet sweat throughout the day, and the leather and lining of our shoes absorb all that moisture. This can cause the lining to rot, your shoes to smell, and the leather to crack over time, thereby ruining your expensive footwear. A shoe tree holds a shoe in its proper shape so it dries out correctly, and keeps the leather from cracking by wicking away moisture. The absorbent wood also helps dry out the lining of shoes so that they don’t rot from the inside out. Long story short: Shoe trees are a whole lot cheaper than a new pair of nice shoes, and will keep your current pair in excellent condition for years. I would highly recommend spending on a good pair of shoe trees if your shoes cost more than $200. Quality shoe trees will have ventilation slots at the toe to help dissipate moisture, a longer, crafted heel, and contain more wood for better drying and odor control. They will also ensure the closest possible fit between the shoe and tree. This is necessary to maintain the shape of the shoe as well as to absorb moisture. WHERE CAN I GET GOOD QUALITY SHOE CARE PRODUCTS? 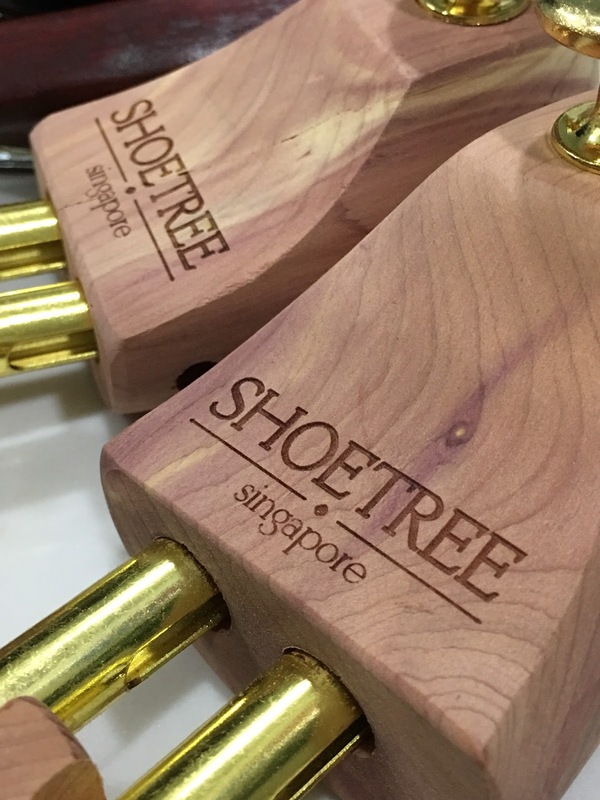 This is the most common question about shoe trees and products, especially when everything is so expensive in Singapore. 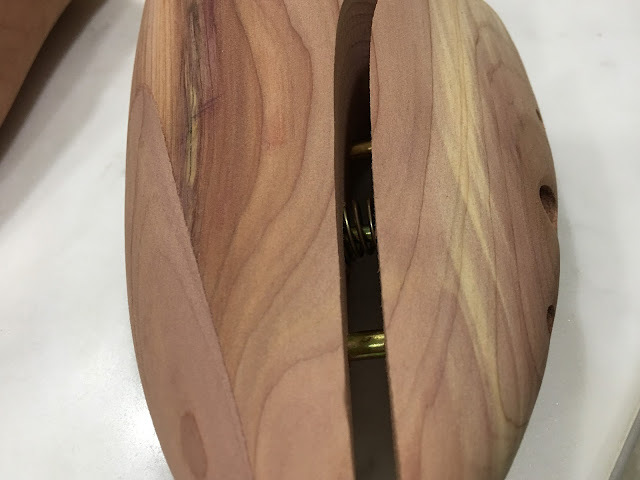 I remember back in 2007 when i started sourcing for cedar shoe trees, they were really hard to find and the ones i found would cost $70-100 per pair. The folks at Shoetree Project seem to have realised this gap and have sent me some of their products to review. They are the Cedar Shoe Tree in Sz 39, Saphir Pommadier Cream Shoe Polish and the Japanese Oakwood Shoe Horn. Next up, the Cedar Shoe Tree. I was pleasantly surprised by the unmistakable smell of quality Cedarwood and even more impressed by the sizing and fit. The sz 39 *(please check out their size charts) fit like a glove on my Loake shoes. The spring loaded mechanism on the exterior side ensured that the shoe retains its shape - an important aspect of a quality shoe tree. Aesthetically, the brass knobs on the top of the shoe tree adds a nice touch to your shoes when it does its job of wicking the moisture whilst sitting in your cabinet. Last by definitely not least is the Japanese Oak shoe horn. I personally like to sit on my ottoman to wear my dress shoe but this shoe horn would be a great addition for those who wear slip-ons, loafers and moccasins. It would be ideal to have a shoe tree in every nice (expensive) pair of shoes you own, but it’s not absolutely necessary as long as you rotate your shoes and shoe trees throughout the week. But if you’re a huge fan of all your shoes or have a vast collection of expensive footwear, then buy a shoe tree for every single pair. At the $35 price point, there is practically nothing else i can recommend. If you haven't got one, i would highly recommend you try the ones by shoetree.sg - your feet, wallet and shoes will thank you for it! Shopping on the UK websites provide great value with the recent weakness of the GBP. However, there are some sites that do not accept international credit cards nor ship to destinations outside the UK. I wanted to get a pair of Adidas NMD sneakers for my wife but there was no stock available in Singapore. I discovered that UK Footlocker still held stock of the shoe in her size. 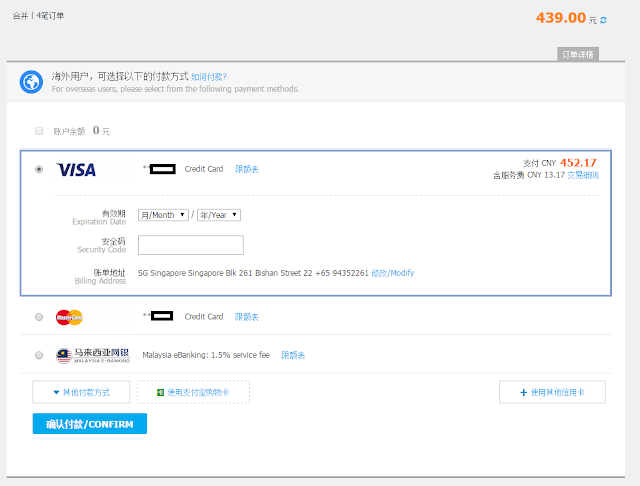 So i went about trying to find ways to buy from a UK site that did not accept Singapore credit cards, nor ship directly to Singapore. This is where i chanced upon the Borderlinx concierge service. In essence, it provides a 'personal shopper' service for a 5% fee (off the total value of goods). In addition, Borderlinx provides shipping service back to Singapore. So if you need to buy something from the UK in a similar fashion, you have the option to use the Borderlinx Concierge service. Lets talk about how we can proceed with the orders before i give you a summary of my personal experience. Register an account with Borderlinx and setup your home address. Access your account, select "Make a concierge order" and click "Place a new order". Save the item and you will be brought to the order payment page. Payment has to be made before the product will be purchased by Borderlinx. Typically you will use a Credit Card. Do note that you will incurr the usual cross-border and currency rate (GBP vs SGD) on your credit card. In addition, there is a 'contingency' charge. This fee is 'blocked' on your credit card just in case there is a slight price difference from the input price of the product. As its name suggest, you will not be charged unless there is a difference (increase in price). When the product is purchased by Borderlinx, you will see an update on your concierge order status that says "Status: Order placed and accepted by merchant". Once this step is completed, the merchant will ship your order to the Borderlinx warehouse. As you can see, i was charged GBP $36.16 for a shipped weight of 3.78 kg. Once the shipping costs are paid, Borderlinx will proceed to ship the purchase to Singapore, via DHL - to your desired home address. You can track the shipment history in your concierge menu -> "My Account" -> "Shipment History". I paid a total of GBP 139.99 + GBP 36.16 (Shipping). This translates to about S$315 at the currency rate i paid on my credit card. These shoes retail for about S$299 in Adidas Singapore, assuming you are willing to brave the long queues at the retail store and lucky enough to get one in your size. The total time taken from entry of the concierge order to purchase of the shoes from UK Footlocker is 3 business days. 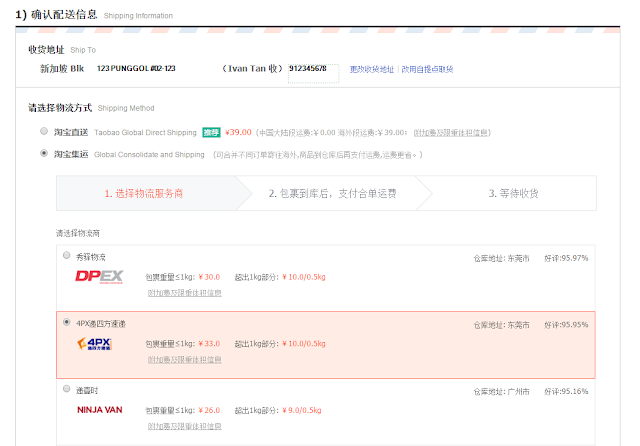 Shipping via DHL by Borderlinx was fast and it took about 2-3 days before it was delivered to my doorstep in Singapore. Package was well packed and arrived in immaculate condition. I wrote a post about "The Complete 4PX Guide" when Taobao first became popular in Singapore back in 2014. It has since been 2 years and after several changes to the interfaces and links, i would like to give an 'update' to this guide to help you with your shopping. 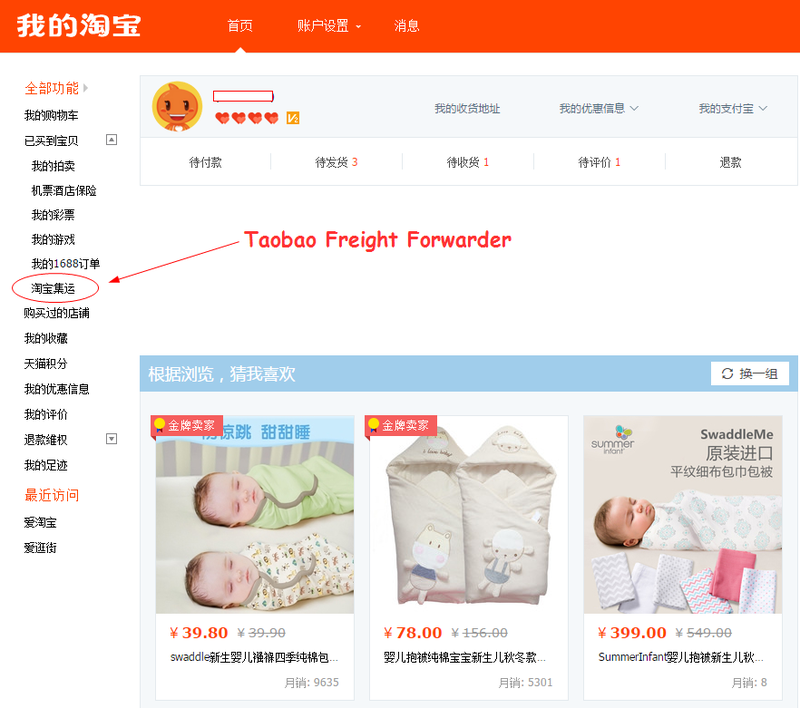 This update will be applicable to any of the Taobao Official Freight Forwarders - 4PX, Prouter, NinjaVan and DPex. I am assuming that you have already read the Taobao Account Creation guide and have an account ready. So i will go straight to the main highlights of using a Taobao appointed official freight forwarder. This step is pretty important for home deliveries. 4PX has a tie-up with Singpost for POPStation deliveries. But nevertheless, it is important to input the right address to ensure your goodies will reach you! Add your home (Singapore) address. I am going to buy some caps for my son, so let's add them to our Shopping Cart. 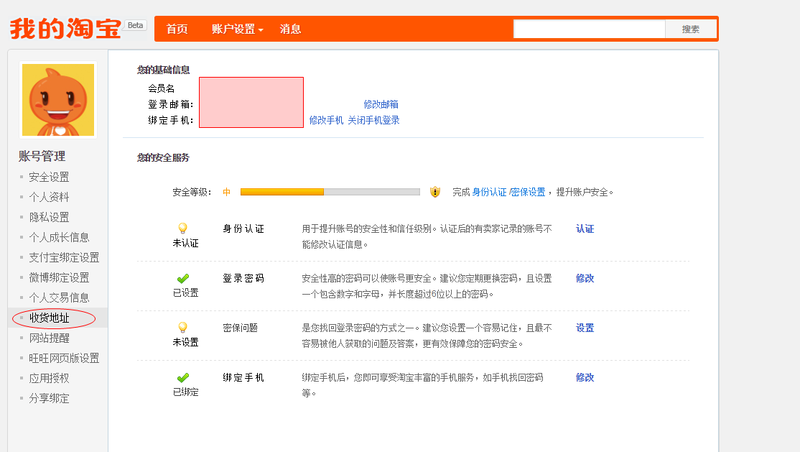 Select the items and click the "结算" button at the bottom. You will see the following screen. 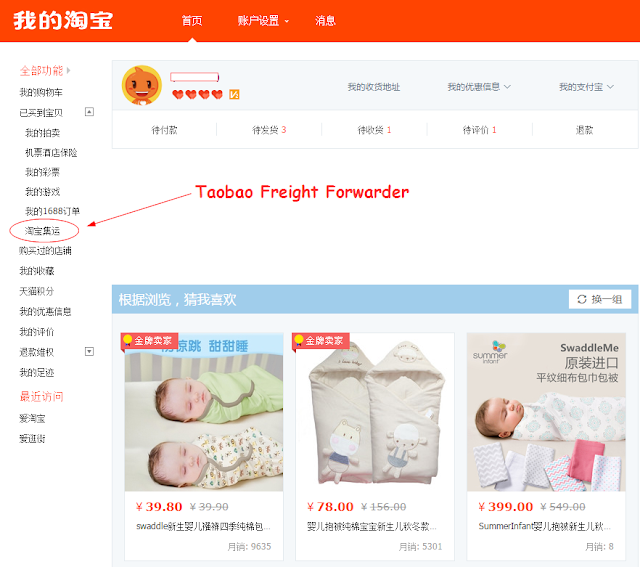 As you can see, the rates are clearly displayed for each of the Taobao Official Freight Forwarders. For our example, we will use 4PX to deliver our purchases. 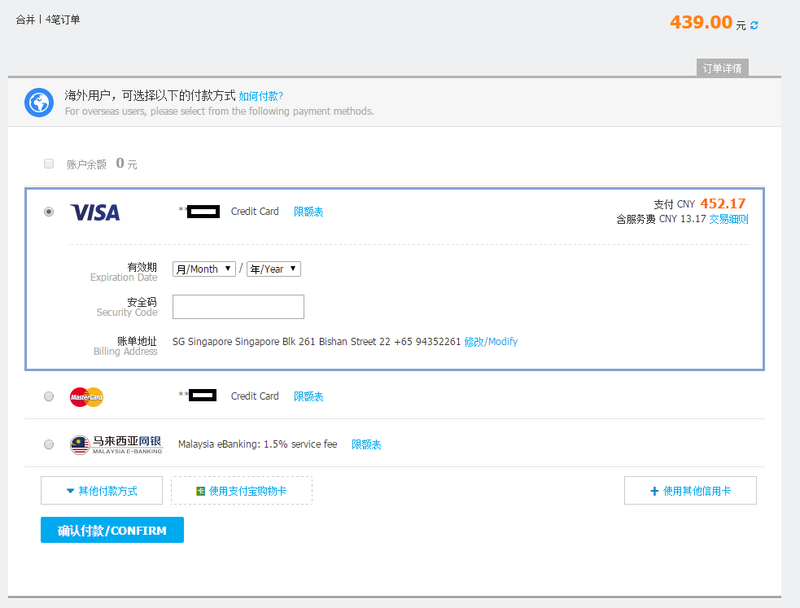 Pay for your purchases via Alipay. As you can see from the screenshot, there is a credit card fee that you will have to bear (approximately 3% of your entire order). Once the payment is made, the seller(s) will proceed to ship the items to the 4PX (Or your designated freight forwarder) warehouse for consolidation. 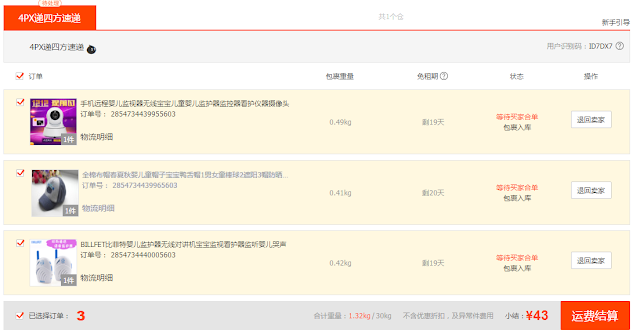 You can proceed to check the statuses of your purchase from the menu "淘宝集运". You will be able to track your purchases, as well as view the corresponding costs of shipping it to Singapore. When all the items have arrived at the freight forwarder's warehouse, you can proceed to consolidate and pay. You will be notified by SMS when you packages arrive at the 4PX warehouse. 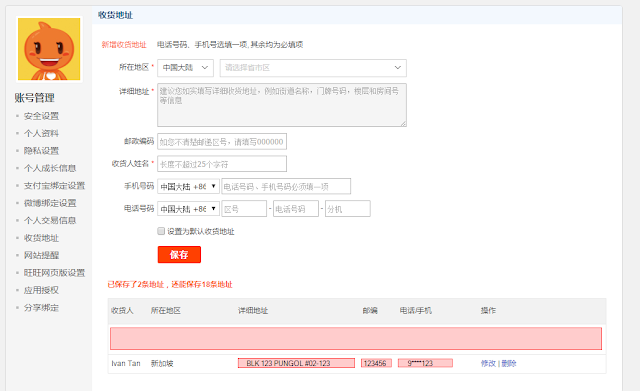 Login to Taobao to select the purchases to be grouped. (Check the "订单" checkbox on each item). 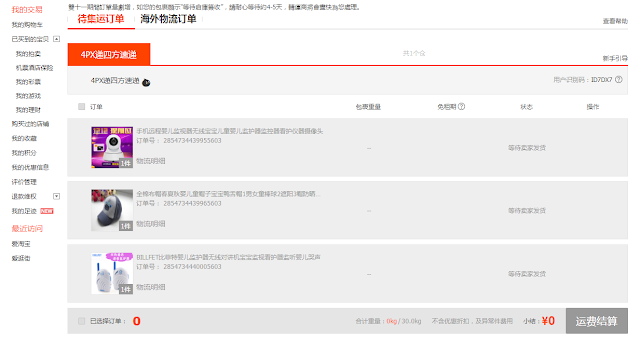 Click "运费结算", which means "pay for shipping". Note: This step is where you select "Home Delivery" or "Self-Collection" (POPStation). Once you have completed this final payment step, the freight forwarder will proceed to pack and ship your items to your home in Singapore (or POPStation, if you have selected the Self-Collection method)! Sit back, enjoy a cup of tea and wait for your package(s) to arrive! Update: Very impressed with the speed of their service - Received the SMS from Singpost about delivery of the package after 3 working days. All in 4PX consolidate and pay to delivery took about 5 days (2 days over the weekend). Here's a picture of what arrived - nicely packed and sealed, delivered by SingPost. Black Friday (25 November 16) is the biggest shopping event in the United States. Akin to the 11.11 Singles Day sales in China, people wait for this day to make their year-end purchases, usually at steep and unbeatable discounts. Although many of the steep discounts are found in-store, in the recent years, these discounts have also been extended online. The official Black Friday Date takes place on the first Friday after Thanksgiving. Although mainly celebrated in the US, many countries that do not celebrate this holiday are also starting to take part in the shopping fun that this holiday represents. The shopping frenzy has spread to the UK and even here in Singapore. Although the US$ is reasonably strong this year, I personally will still be looking to get my Christmas gifts as well as some tech. items that are hugely discounted. Here are some of my favourite online stores that either ship to Singapore or accept International Credit Cards. If you decide to buy from a store that only ships within USA, fret not! Simply use an international freight forwarder like ezbuy*, comgateway, hopshopgo, VPost or borderlinx to ship your purchases back home. * You can read more about how i ship my US purchases from Amazon to Singapore here. Read on for some of the great deals that i will be sharing this Black Friday! You can get some of the best deals from Amazon, Polo Ralph Lauren, JCrew, Tory Burch and more. I personally got a Samsung 850 EVO 250GB SSD during the last Black Friday, at only US$79 ! This year, i intend to build a new desktop PC and will be looking out for more SSD and computer component bargains (I have shared some below - the Kingston 240GB looks like a steal!). Shopping Tip: Use a cash back enabler like eBates when shopping in the US! * You will need a freight forwarder (Concierge Service) for some of these US Stores. Don't forget your free $5 cashback from Shopback. eBates - Shop & Save! Sugar, Spice, Everything Nice. Powered by Blogger.